After 2001 whenever I hear a plane flying over my shoulders cringe and I feel worried. Panic sets in and I try to find the plane overhead. I can’t help it. The attack was so real to me and I didn’t know anyone that was on any of those planes. People watched their tv for weeks and I’m sure there are others that still worry. The terrorist attack changed how America views the government and our own safety in our borders. I still believe in our government, we are free. Reading National Security MOM opened my eyes to my fears. When we live our life in fear the terrorists win. We need to be strong and independent and live without fear as we are trying to teach our children the same things. They model our behaviors and we should live the principles we wish to instill in them. I love the title of Chapter Sixteen and I’m going to quote it. “We must be the change we wish to see”. Gina M. Bennett writes from her experience as a government employee working against terrorism for 20 years while raising her family for 15 of those years she kept them separate. Now looking back she sees them as the same. National Security MOM is separated into three sections. Section one is called Redefining Security: a parents perspective, Section two is called What we teach our kids is good advice for America, and the Third Section is called The strength of a nation derives from the integrity of the home. our nation strong and secure. imagines a day when our children are America’s leaders. Well, before I give you a dissertation about the book I better stop. 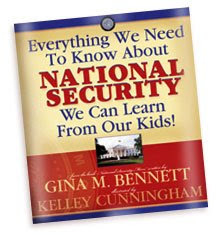 You can purchase this book National Security Mom I enjoyed it much more than I thought I would. Interesting Read. I am glad I had this opportunity and even happier to say that I can offer one of my readers Everything We Need to Know About National Security We Can Learn From Our Kids. To Enter: Tell me something funny about your kids. I’ve been teaching her to share with her brother. There are things I don’t want her to give her brother, like paper and grapes. He could choke, so I have to tell her don’t give that to your brother. So she says, “Mommy, I share! Then she says, Mommy share!” It was so cute and I was at a loss for words. Subscribe, if you have subscribed please re-subscribe. I can track it now. Leave a comment for each entry and contest ends January 5th.